It wasn't quite the 50th birthday present Clyde boss Danny Lennon was looking for. On Grand National Day a draw against Peterhead left his side clinging on in the League 2 title race after looking for all the world like they were going to come a cropper five hurdles from home. A quite stunning strike by teenager Scott Banks kept them just about on their feet, but needing their opponents to falter dramatically on the run-in if they are to be overhauled before the finish line. Clyde fans made a point of wishing Lennon a happy birthday pre-match. But Peterhead proved to be party poopers just three minutes in, Blair Currie allowing Wille Gibson's low free-kick from 25 yards to elude his grasp and slip inside his left-hand post. Despite this setback Clyde continued to make most of the running. But they found themselves two down just after the half-hour mark when Paul Willis slid the ball past the helpless Currie after being left in the clear as the visitors opened up the Bully Wee defence on the counter. At 2-0 down Clyde knew the next goal was critical and Lennon made a positive half-time switch, replacing defensive midfielder Ray Grant with Banks. And what an impact the on-loan Dundee United teenager made. Just two minutes after the restart he planted a sumptuous cross from the left smack onto the head of David Goodwillie who powered home his header from six yards. Game On. But the wind was quickly taken out of the Clyde sails by Peterhead's response. Just five minutes later Scott Brown made space for himself on the edge of the box and let fly. It was a decent enough hit, but having got hands to it Currie would have expected to keep it out. But he didn't. And Peterhead had their two-goal cushion restored. Not for long though. A host of comebacks and late goals this season have proved Clyde are nothing if not resilient. They were denied a penalty when Scott Brown appeared to use a hand to prevent Scott Rumsby's header crossing the line just before the hour. Shane Sutherland did rattle the Clyde bar in a counter attack. But the momentum was with a Clyde side who sensed the could yet salvage a remarkable victory. And perhaps namesake Jason Brown felt compelled to provide some sort of justice when he inexplicably knocked away Mark Lamont's 72nd minute corner with his hand. This time the penalty was given and Goodwillie was calmness personified as he casually rolled the ball past Greg Fleming. Cue celebrations among the home fans. But their exhilarated response to that goal was nothing compared to the euphoria which greeted the equaliser six minutes later. Banks collected the ball 25 yards out, looked up and unleashed an unstoppable left-foot finish which scorched beyond Fleming's reach and exploded into his top right-hand corner. From a position of having the game firmly in their grasp, Peterhead were suddenly on the rack. But they held firm and in the end the outcome to a pulsating afternoon was a share of the spoils and a draw which felt like a defeat in both camps. 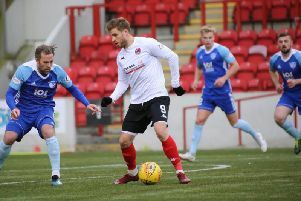 For Clyde there was the disappointment that even a praiseworthy comeback draw wasn't enough to put them right back in title contention. For Peterhead there was frustration that a game they seemed to have won twice had been allowed to slip away. For the fans there was cracking afternoon's entertainment - and a goal to be remembered for a long time to come.